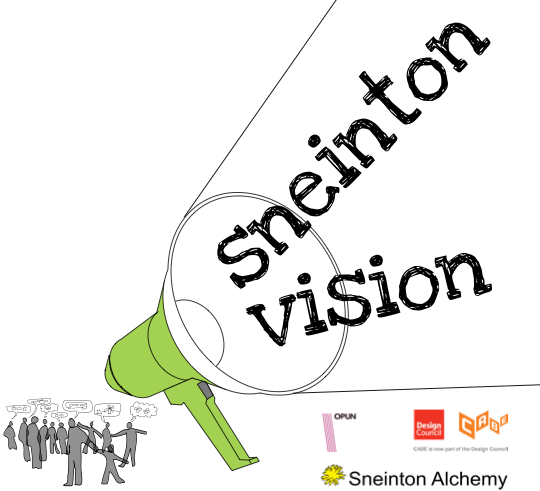 Sneinton Alchemy are pleased to announce the first events of the Sneinton Vision project! In collaboration with OPUN architecture centre for the East Midlands and funded by Design Council CABE, this project will produce a "Neighbourhood Design Vision" for Sneinton. The Vision will be created from the ideas of local people, businesses and agencies, and will identify shared aspirations for the future of the area. Lots of changes are happening to the system which decides what happens locally- there is now (and for a short time only) the chance for the local area to have a real voice in what happens in the future. The planning system is under review, which might allow a lot more development to happen in our neighbourhood. That could be a great thing for Sneinton, but we need to make sure that the right kind of development, that benefits our community, gets the green light. The Neighbourhood Design Vision is the first step in making this happen. Over the next few months, a programme of events will happen to collect the ideas and aspirations of Sneinton and mould those into a set of guiding principles for future development. This will help in creating a development plan in the future- setting out what sort of things we want to happen and where. The first events will happen on Friday 21st October, at the launch of The Secret Kitchen (6pm, St Christopher's Church Hall, Trent Road, Sneinton NG2 4AL), and on Saturday 22nd October as part of Apple Day at Sneinton Market. We look forward to meeting you there!